Learn how to hide and redisplay metrics. You can manually hide metrics from the Metrics browser and in the autocomplete dropdown associated with queries. Manually hiding metrics does not permanently delete a particular metric or metric namespace from Wavefront. To view, hide, and redisplay metrics, select Browse > Metrics. While every Wavefront user can view metrics, you must have Metric Management permission to manage metrics. If you don’t have the permission, the UI menu selections, buttons, and links you use to perform management tasks are not visible. In the Metrics browser, click the Manage Hidden Metrics button. In the dialog type a complete metrics name (e.g. requests.latency) or a metric prefix (e.g. requests., cpu.loadavg.). This field does not support auto-complete, so you have to type the entire metric name or metric prefix. Wildcards are not supported. The * character is considered part of the text string. Press Enter to add the metric or metric prefix to the list. The list takes effect only after you save. Repeat to add more metrics and metric prefixes to the list and click Save. In the Metrics browser, hover over a metric folder or metric name. A Hide Metrics button displays at the far right of that row on the list. If you are hovering over a metric name, the Hide Metrics button appears directly to the left of the Info button. Click the Hide Metrics button. The metric or metric prefix is added to the hidden metrics list. To view all manually hidden metrics and metric prefixes, click the Manage Hidden Metrics button. A list of metrics and metric prefixes that have been manually hidden displays. This list displays only metrics and metric prefixes that were manually hidden. If a metric or metric prefix has not had a single data value reported in the last 4 weeks, Wavefront considers the metric or metric prefix obsolete and hides it. Metrics and metric prefixes that are automatically hidden displayed in this list only if they were also manually hidden. 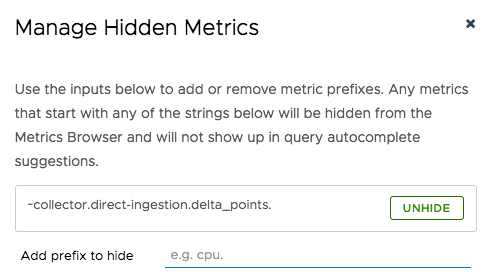 In the Metrics browser, click the Manage Hidden Metrics button to view the list of manually hidden metrics and metric prefixes. Click the Unhide button to the right of the metric or metric prefix to unhide. Click Save. The selected metric and metric prefixes appear in the list of metrics in the Metrics browser and in the autocomplete dropdown associated with metric names. The selected metrics and metric prefixes only appear again in these cases if they have had at least 1 reported data value in the last 4 weeks. Otherwise, these metric/metric prefixes are considered obsolete metrics and Wavefront automatically hides them by default.